Submitted by slowdive on 2015-08-09 20:36. Lots of updates by Karl. See the iceblinkengine.com/forums for more info. Lots of updates by Karl. See the following links for more info. For those moving their module projects from a previous IB2 beta build, all you need to do is COPY (always keep a back-up just in case) your module's folder to the "modules" folder of this build. Happy building and let us know of those bugs you find or suggestions you have. Fixed a nasty bug that would cause the toolset to crash when creating a new area. Was due to D2D resources not being created for new areas. 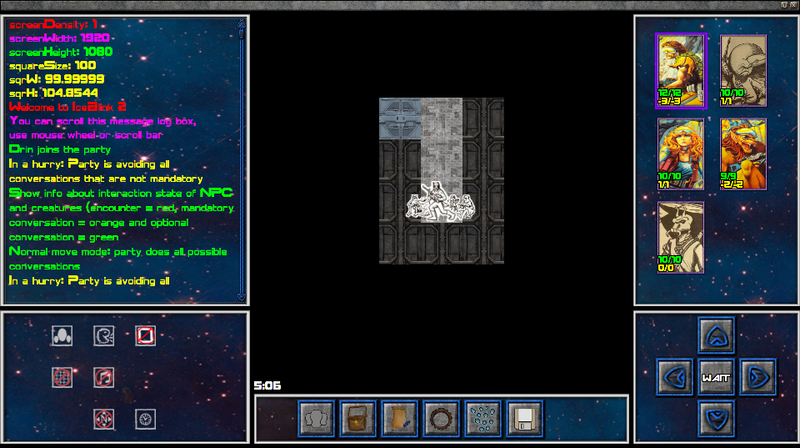 Also, added the tile scaling functionality to the game engine. For those moving their module projects from a previous IB2 beta build, all you need to do is copy your module's folder to the "modules" folder of this build. Happy building and let us know of those bugs you find or suggestions you have. More bug fixing and polish. Re-implemented continuous painting of walkable and LoS squares by holding down mouse button and drag over other squares. Added ability to use custom buttons that use IBScripts for functionality. I temporarily added a "Rest" button to Lanterna as an example of how to make a custom button. Can now set a Props initial facing direction to either left or right facing. Added the Visible distance property to Areas again so that you can adjust the FoW distacne for each area. Can now have floaty text over Props that will show up when mouse over prop. For those moving their module projects from a previous IB2 beta build, all you need to do is copy your module's folder to the "modules" folder of this build. Happy building and let us know of those bugs you find or suggestions you have. More bug fixing and polish. Adjusted the new UI Layout system to take into account all different screen resolutions. Added mouse over floaty text to main map screen. If you put some text into a Prop's MouseOverText property (other than "none"), that text will be visible when the player mouses over the prop. Also, added full screen maps to combat and main map so now you can fill the screen (19x10 squares) with the map (use "x" to hide/show the UI). For those moving their module projects from a previous IB2 beta build, all you need to do is copy your module's folder to the "modules" folder of this build. Happy building and let us know of those bugs you find or suggestions you have. More bug fixing and polish. Added a new UI Layout system that allows module builders to modify or create their own UI layout and even add custom buttons (custom buttons not working just yet). Have a look in the default/NewModule/data folder for the MainUILayout.json and CombatUILayout.json files. Copy those files into your module's data folder if you want to edit them for a custom look. Added scaling tiles as well...use the 'q' and 'e' keys to enlarge or shrink tiles before placing them. For those moving their module projects from a previous IB2 beta build, all you need to do is copy your module's folder to the "modules" folder of this build. Looks like v16a file was corrupted in the upload process so here is hopefully a working file. I also added new versions of the engine and toolset that include the encoutner editor using Direct2D and allowing for tile modifiers (shift, rotate, mirror). 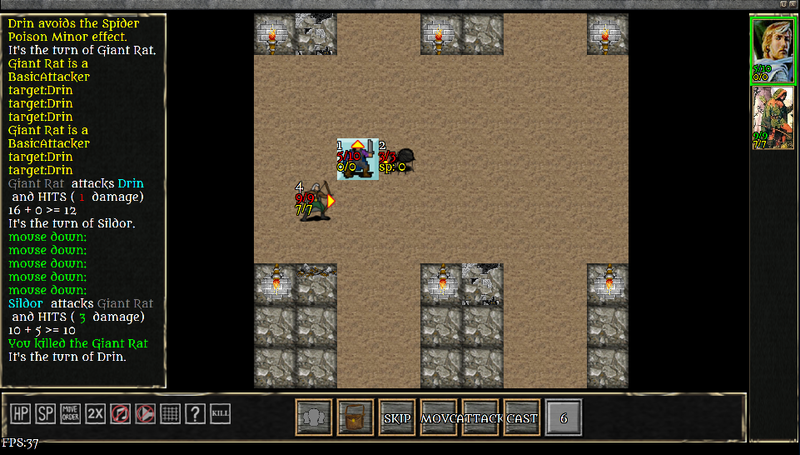 Added a new version of Lanterna that was for testing the encounter tile modifiers (see tomb encounter). For those moving their module projects from a previous IB2 beta build, all you need to do is copy your module's folder to the "modules" folder of this build. This is more of a preview build for v16 as there are some incomplete parts and probably more buggy than usual. Feel free to open up the toolset and explore some of the new features we are working on and try them out in game as well. A list of new additions: items can use the spell/effect system with AoE, new system that allows up to 100x100 square maps that use single image for background, using a proper game loop now and revised the combat animations to use it, seamless map system, weather system updates (not a toolset weather editor just yet, w.i.p. ), changed the toolset to use Direct2D for area editor (soon to come for encounter editor as well), can modify tiles before placing them ("escape" to reset tile modifiers to default, shift x/y "wasd", rotate "r" or "shift+r", mirror "m"...soon to come scale x/y). For now, to adjust a placed tiles modifiers, you have to actually delete the tile (use "t_blank" tile) or replace the tile. In the future I will add a way to edit a placed tile's modifiers before and after it is placed. Major additon of a new Spell/Effect system so expect this version to have some bugs (maybe lots ). 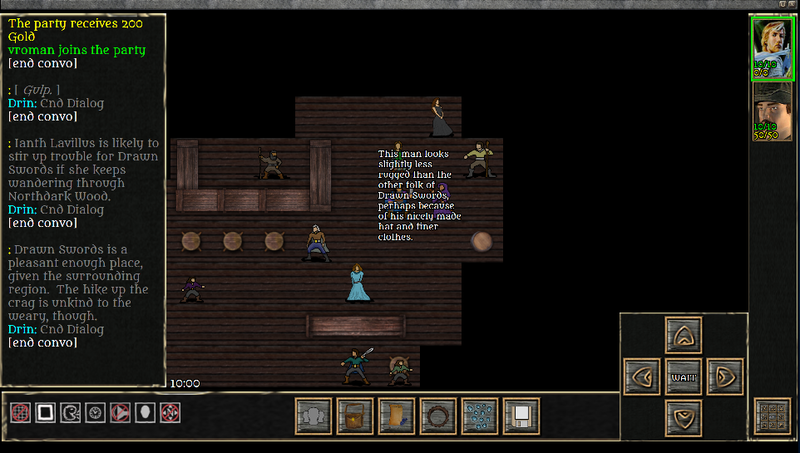 I have added Lanterna again as it has all spells converted to the new system and some items using the system as well. Still a beta version so keep those bug reports and polish suggestions coming. For those moving their module projects from a previous IB2 beta build, all you need to do is copy your module's folder to the "modules" folder of this build. Bug fixes and more polish updates. Added custom font features that allow builders to use theri own fonts and tweak the font size to fit the UI better. Still a beta version so keep those bug reports and polish suggestions coming. For those moving their module projects from a previous IB2 beta build, all you need to do is copy your module's folder to the "modules" folder of this build. 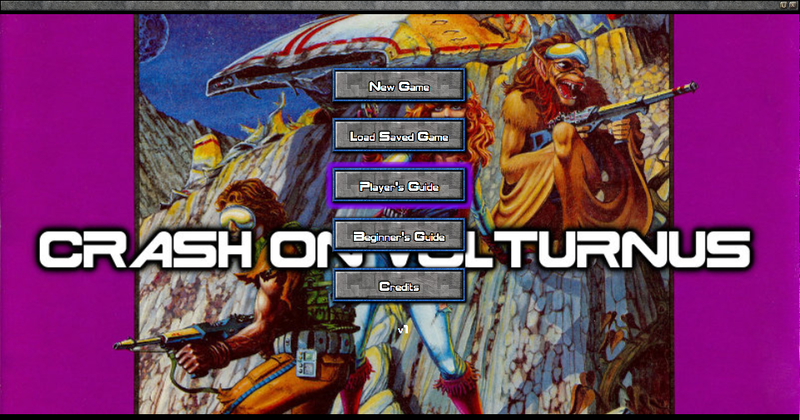 Included an early build of "Crash on Volturnus"...still a w.i.p. Bug fixes and more polish updates. Added new Area of Effect (AoE) system for spells that uses shapes such as cone, line, and circle. Created two new spells, lightning (line shape) (not bouncing yet) and Flame Fingers (cone shape). Added a new death animation (laughing skulls from goldbox). To use them in your module, copy the "death_fx.png" file from Lanterna's "ui" folder into your module's "ui" folder. Still a beta version so keep those bug reports and polish suggestions coming. 'Lanterna - The Exile' is included and is pretty much complete so feel free to play and let me know how it goes :-) For those moving their module projects from a previous IB2 beta build, all you need to do is copy your module's folder to the "modules" folder of this build. If you plan on adding the new spells to your module, make sure to use the merger editor and copy over the following from Lanterna/graphics: fx_lightning.png, sp_flamefingers.png, sp_flamefingers_off.png, sp_lightning.png, sp_lightning_off.png. Bug fixes and more polish updates. Added large Props (they are really just one square props drawn larger, purely cosmetic at this point). Still a beta version so keep those bug reports and polish suggestions coming. 'Lanterna - The Exile' is included and is pretty much complete so feel free to play and let me know how it goes :-) For those moving their module projects from a previous IB2 beta build, all you need to do is copy your module's folder to the "modules" folder of this build. Bug fixes (lots of DX memory leaks fixed) and polish updates. Added a portrait frame UI option when choosing to use the new panel system in your module. Add the ability to use tiles larger than 1x1 square. You can use tiles up to 3x3 in size (may go large later) on both main maps and combat maps. Still a beta version so keep those bug reports and polish suggestions coming. This update moved the engine to using .NET 4.0 Framework which is the same version of .NET Framework required to use the toolset. Bug fixes and polish updates. Lots of UI work including a new background panel system and a whole new UI set which is showcased in "Lanterna - The Exile" (included in v10 download...the module is not completely converted to IB2 yet, still a w.i.p.). Still a beta version so keep those bug reports and polish suggestions coming. Bug fixes and polish updates. Also, the area system and editor (merged the world map and regular area editors into one editor) have been revamped. For those working on existing modules, you will need to go into each area that was using the old single image map style (not the world map style) and change layer1 tiles from "t_grass" to "t_blank" by using the "fill area" button with layer1 selected. Otherwise since layer1 was defaulted to using the "t_grass" tile for all layer1 tiles, your single image map will be sitting under a layer of grass and you won't see it. Make sure all the layers 1-5 are using "t_blank" (this is a transparent tile) if you do not want to use tile layers and only the single image for your map. Using a combination of a single image and tile layers on the same map is now possible. 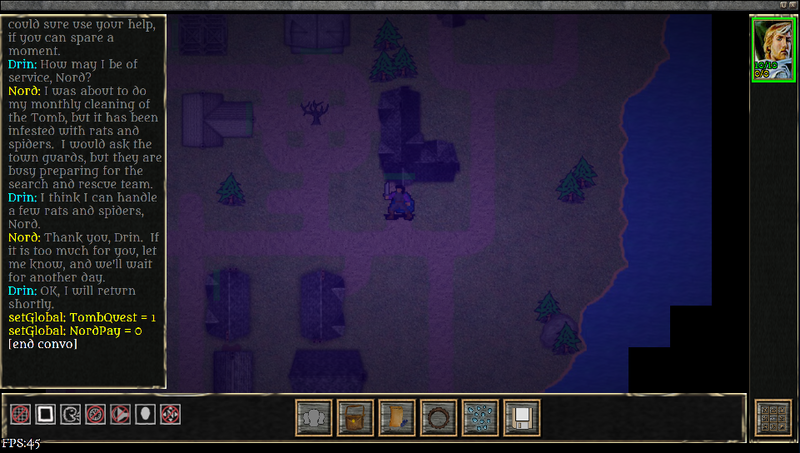 Also, the minimap is used on all areas and is automatically created by the game engine. Having just one editor will simplify building and be less confusing to new builders. Now program will try and use the highest DirectX Feature Level available on your graphics card (Level_11_0, Level_10_0, etc.). I tried running on a DX9 card to no avail. I don't have a DX10 card so I couldn't test this, but in theory it should work if you have DX11 drivers installed (I believe all win7 machines come with DX11 support) with a DX10 gfx card or higher. If you run across any DX device initialization errors, please send us the "IB2ErrorLog.txt" information to track down those bugs. Added an error log system to the IB2 engine (not in the toolset yet). When an error occurs and is handled/caught, the IB2ErrorLog.txt file is appended or created with the error message. Hopefully this will help us track down and fix bugs during the beta period and beyond. Fixed a couple of bugs that were due to not finding files with the new file clean up and reorganization work I did recently. This release does not include Hearkenwold (you can grab that from v5 if wanted). For those moving their module projects from a previous IB2 beta build, all you need to do is copy your module's folder to the "modules" folder of this build. More features, bug fixes, polish and improvements. I also synced up both the Android and PC engines now so that they have the exact same code or at least the same functionality. Modules created with the IB2 toolset will run the same on both the PC and Android IB2 engiens and saved games can be transfered back and forth between Android and PC. This still has not been fully tested/optimized for any other resolution than 1920x1080. It should work fine, but may have weird layout issues on some screens. More features, bug fixes, polish and improvements to Project Living World (PLW) with smooth moving props...still a w.i.p. This would be a good build to start a project with if you haven't already started. To migrate a current module project to this build (v4), just copy your module folder into the "modules" folder of this build...that's it. Updated engine now using DirectX (Direct2D) for all rendering (very fast now). Lots of bug fixes and a few new features added...still a w.i.p. Updated with a few bug fixes and completed converting Hearkenwold encounters to the new IB2 system. I'll add more documentation as we continue to fix bugs, add polish, add more features, etc. I have't really tested on screens other than 1080p so other resolutions will probably work okay, but may need some work on UI sizing and location. Once the PC version of the IB2 engine is ready for its initial release (non-beta), then I will begin work on making the same changes to the Android version of the IB2 engine. Going forward, as new features are added to the PC version, I will add them to the Android version as well. Both versions will be identical so that modules created in the toolset will work on both the PC and Android. EDIT: Android and PC versions are now in sync and identical for IB2 (as of beta build version 5). Can I use original Iceblink content (Portrait Pack, Token Pack, Raventhal) in Iceblink 2?